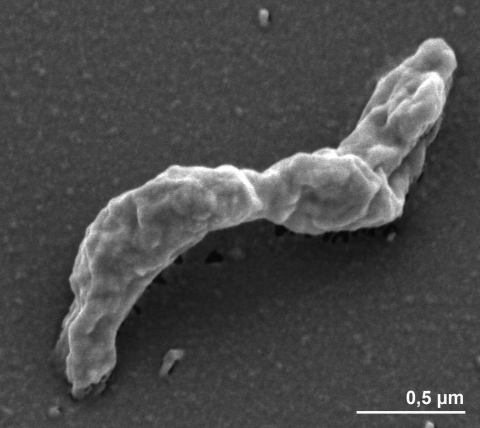 The species D. baarsii represents a separate lineage within the Deltaproteobacteria which is only distantly related to most other members of this class. The closest relatives based on 16S rRNA gene sequence similarity values are the type strains of Desulfomonile tiedjei (87.6% sequence identity) and Desulfomonile liminaris (87.2%), both belonging to the family Syntrophaceae within the order Syntrophobacterales . 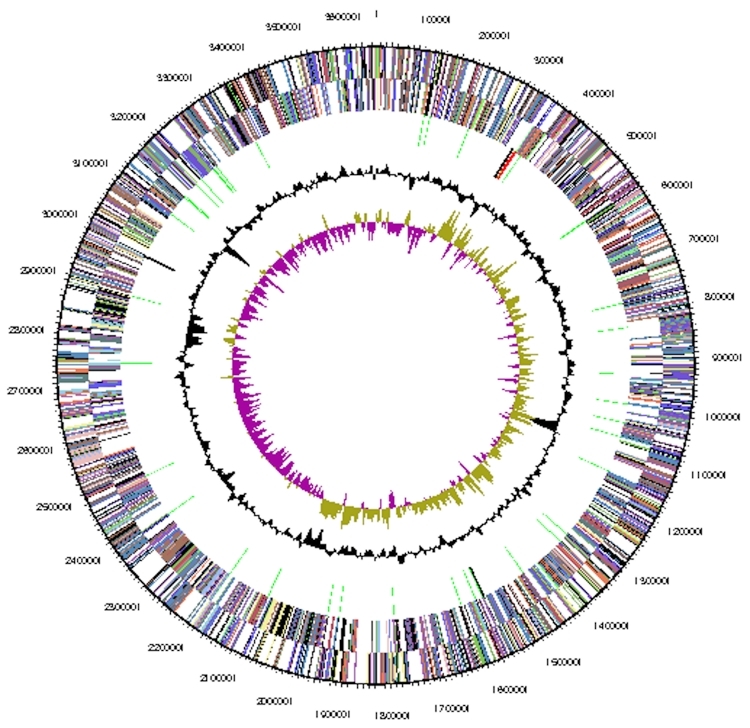 The most similar cloned 16S rRNA gene, EUB-42  shared only 95.5% sequence similarity with D. baarsii and was retrieved from anaerobic sludge. Strain 2st14T represents the only strain of this species available from a culture collection, thus far. Currently available data from cultivation independent studies (environmental screening and genomic surveys) did not surpass 86% sequence similarity, indicating that members of this species are restricted to distinct habitats which are currently undersampled in most environments or are in low abundance, (status October 2010). The single genomic 16S rRNA sequence of strain 2st14T was compared using BLAST with the most resent release of the Greengenes database  and the relative frequencies of taxa and keywords, weighted by BLAST scores, were determined. The five most frequent genera were Desulfovibrio (43.3%), Syntrophobacter (14.4%), Desulfomonile (11.8%), Desulfarculus (9.6%) and Desulfatibacillum (7.5%). The species yielding the highest score was D. baarsii. The five most frequent keywords within the labels of environmental samples which yielded hits were 'sediment' (4.5%), 'microbial' (4.5%), 'lake' (1.7%), 'depth' (1.7%) and 'sea' (1.6%). Environmental samples which yielded hits of a higher score than the highest scoring species were not found. The cells of D. baarsii 2st14T are vibrioid, Gram-negative and 0.5-0.7 by 1.5–4 µm in size (Figure 2, Table 1). Motility is conferred by a single polar flagellum (not visible in Figure 2) . The temperature range for growth is 20-39°C with an optimum around 35°C. The pH range for growth is 6.5–8.2, with an optimum at 7.3. The strain grows optimally in the presence of 7–20 g/l NaCl and 1.2–3g/l MgCl2 × 6 H2O, but growth is nearly as rapid at lower concentrations . D. baarsii strain 2st14T is a strictly anaerobic, non-fermentative, chemoorganotrophic sulfate-reducer that oxidizes organic substrates completely to CO2. Sulfate, sulfite and thiosulfate serve as terminal electron acceptors and are reduced to H2S, but sulfur, fumarate and nitrate cannot be utilized. The following compounds are utilized as electron donors and carbon sources: formate, acetate, propionate, butyrate, iso-butyrate, 2-methylbutyrate, valerate, iso-valerate, and higher fatty acids up to 18 carbon atoms. Growth on formate does not require an additional organic carbon source [5,7]. A high activity of carbon monoxide dehydrogenase is observed in D. baarsii, indicating the operation of the anaerobic C1-pathway (Wood-Ljungdahl pathway) for formate assimilation and CO2 fixation or complete oxidation of acetyl-CoA . D. baarsii, strain 2st14T, DSM 2075, was grown anaerobically in DSMZ medium 208 (Desulfovibrio baarsii medium)  at 37°C. DNA was isolated from 0.5-1 g of cell paste using Jetflex Genomic DNA Purification Kit (GENOMED 600100) following the manufacturer’s instructions, but with 30 min incubation at 58°C with an additional 10 µl proteinase K for cell lysis. Widdel F. Anaerober Abbau von Fettsäuren und Benzoesäure durch neu isolierte Arten Sulfat-reduzierender Bakterien. Dissertation. Georg-August-Universität zu Göttingen, Göttingen 1980. Kuever J, Rainey FA, Widdel F. Genus I. Desulfarculus gen. nov. In: DJ Brenner, NR Krieg, JT Staley and GM Garrity (eds), Bergey's Manual of Systematic Bacteriology, second edition, vol. 2 (The Proteobacteria), part C (The Alpha-, Beta-, Delta-, and Epsilonproteobacteria), Springer, New York, 2005, p. 1004-1005. Kuever J, Rainey FA, Widdel F. Order IV. Desulfarcales ord. nov. In: Garrity GM, Brenner DJ, Krieg NR, Staley JT (eds), Bergey's Manual of Systematic Bacteriology, Second Edition, Volume 2, Part C, Springer, New York, 2005, p. 1003. Kuever J, Rainey FA, Widdel F. Family I. Desulfarculaceae fam. nov. In: Garrity GM, Brenner DJ, Krieg NR, Staley JT (eds), Bergey's Manual of Systematic Bacteriology, Second Edition, Volume 2, Part C, Springer, New York, 2005, p. 1003.